The 12th Annual Podcast Awards nomination opened with the new site and process making the debut earlier this spring. With the re-organization of the awards and the new committee in place to help shape what comes next we feel the site and awards are in a much better position to move forward. While the registration in fee in 2016 was met with some complaints we feel that we are now able to sustain the awards without having to write a personal check each year to make up the difference. While we did entertain bids to sell the awards in 2017, each entity minus one wanted to heavily commercialize it and we felt that the spirit of the awards would not be maintained. Thus we buckled down, used the GoFundMe campaign funds and re-built the site. While the build cost will come in higher than then the money we raised we feel confident that we can make up the difference and proceed in out years with the infrastructure we have now. The new rules for the 11th Annual Podcast Awards have been up for less than 24 hours and my inbox is already full. So I wanted to point everyone to the recent edition of the New Media Show where I laid out the new rules and the reasoning for the changes. If everyone takes the time to listen to the episode, podcasters will get some insights into the changes. 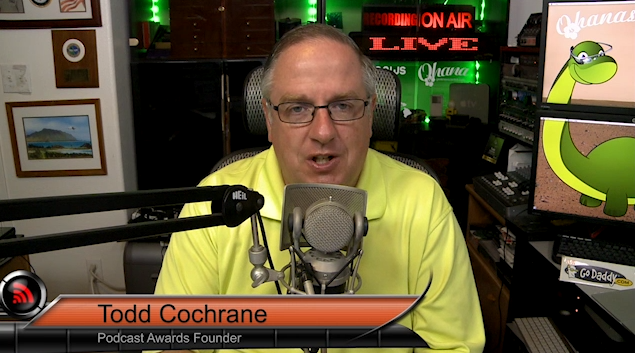 We have launched a GoFundMe campaign to rebuild the podcast awards site.. The goal is to raise $25,000 dollars. Details on what we are trying to accomplish is available on the GoFundMe page and also some background on the changes coming to the entire People’s Choice Podcast Awards process is linked on the Podcast Awards home page. The new rules and structure of the awards will be announced on April 1st. So while I am sure many will want to wait and see what the changes are, I wanted to get the fund raising underway so that we can be well on our way when nominations open on April 15th. Update Feb 2016 – With New Media Expo having abandoned the Awards and not fulfilling contractual obligations of the Podcast Awards Acquisition. 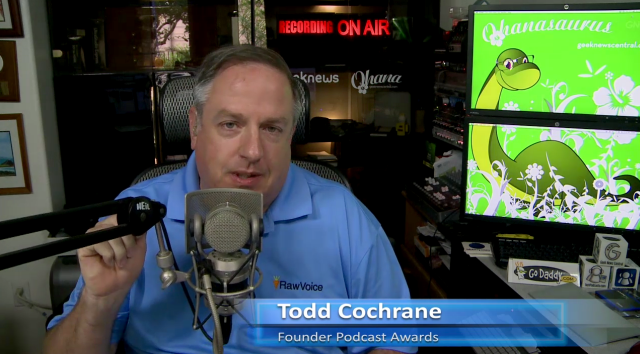 The founder of Podcast Awards has retained control of the site and will proceed to re-launch the awards process in the very near future. As Founder of the Podcast Awards, I want to announce some exciting news. 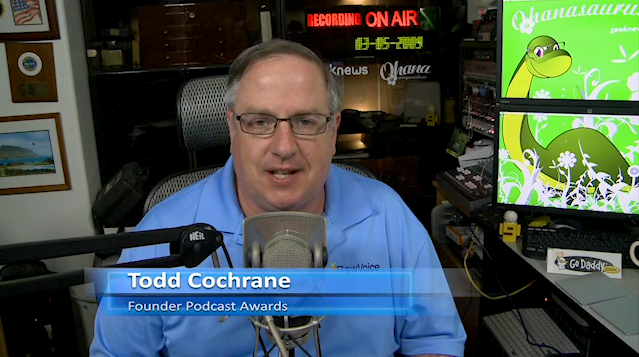 After some thought, I’ve made the decision to sell The Podcast Awards to New Media Expo and their team. I made this decision as Rick and his team have been so involved with us over the past few years. It has been my absolute pleasure to create and run the awards for the past 9 years, giving podcasters a platform to be recognized. All of this would not have been possible without the support of the podcasting community, and the podcasters that supported the show financially. I will be forever grateful for their participation. Over the past couple of years, New Media Expo has been instrumental in our Awards Ceremony’s success. I feel certain that the NMX team is ready to take The Podcast Awards to the next level. Of course, I am not disappearing. I will have a founders’ role and will advise the NMX team in the development and production of the 10th annual event, April 14th in Las Vegas, NV. While Rick and his team will likely make some changes along the way, the spirit of the Peoples Choice Awards will still remain, with the nominees and winners being selected by the listeners, fans and podcasters. I announce the slate of shows that have been nominated for a Podcast Award. 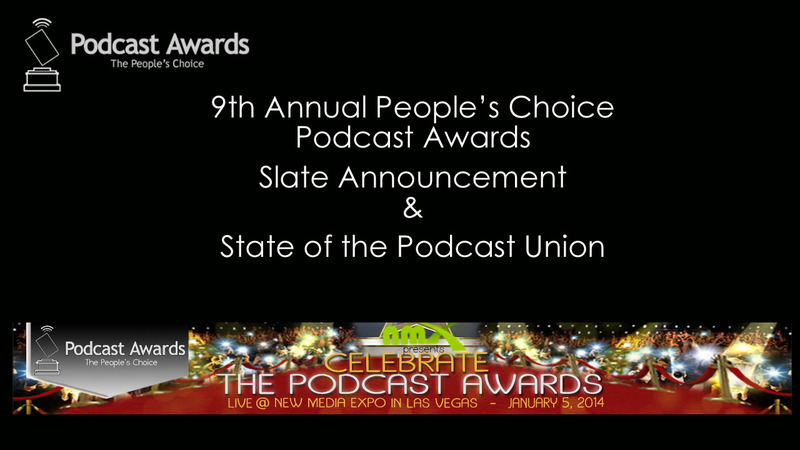 Congratulations to all the show, in this presentation I also share with you my annual State of the Podcast Union..
8th Annual Podcast Awards Slate Announcement. Congratulations to all of the shows. I also share my state of the podcasting sphere with the audience. There are some juicy tidbit in the video..